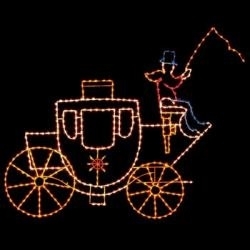 11' Victorian Carriage with man on top with a whip with (435) C7 LED Bulbs. The horses in this category are used with this carriage (Heads up or down). Ground mount display. Use one horse or more. Weighs 252 lbs. Allow 4 to 6 weeks to manufacture. Call for shipping rates anywhere in the world.